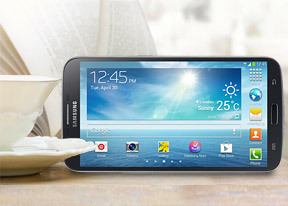 The Samsung Galaxy Mega 6.3 comes with a number of advanced features shared with the Galaxy S4. Some features are left exclusive to the flagship, but the Mega 6.3 still gets a good set. The first one is Air View, which debuted on the Galaxy Note II and worked with the S Pen. There's no S Pen on the Galaxy Mega 6.3, or a need for it - the phone can detect your finger hovering over the screen. This enables information preview (e.g. texts, calendar entries and so on), previewing videos just by pointing to a spot in the timeline, the next track in the music player by hovering over the next button (works with the previous button too), previewing folders, speed dial contacts, and magnifying links in web pages. Air view detects fingers 1cm / 0.5" away from the screen, so there's no danger of accidentally tapping the screen when you meant to use Air View instead. Smart Scroll and Smart Pause are not included although the Mega has the required hardware for it (a front-facing camera), unlike the Air Gestures, which need a special new sensor on the front. S Voice is Samsung's answer to Apple's Siri and Google's own Voice Actions - it can be used to initiate or answer a call, dictate text, play music, open an app, change a setting, make a memo (including voice memo), add a reminder, schedule an event, set or snooze an alarm or timer, check the weather, do a search on the internet, take a photo, look for local listings (e.g. nearby restaurants) and even get an answer to a question. The problem with S Voice is not nearly as fast or as accurate at recognizing your speech input as Now. Naturally, being a Jelly Bean smartphone, the Galaxy Mega 6.3 also comes with Google Now.